CURRENTLY OUT-OF-PRINT -- e-BOOK UNDERWAY! 452 pages, 300+ color pictures of Caucasians from around the world including photos of the 3 regional varieties and rare subtypes. 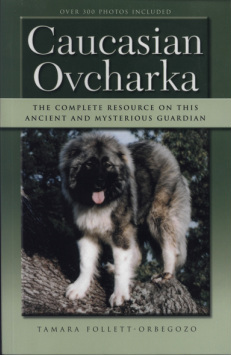 Copies sold around the world; internationally acknowledged as the premier resource on the Caucasian Ovcharka. Includes how to pick the right breeder, what level of aggression would work best for you, training/socialization requirements, problem-solving, and more. "Caucasian Ovcharka" received. It's a WONDERFUL book, so well written, which if I may say, is pretty unusual for breed books. Generally, they are informative but not especially graceful. Cheque will be posted on Monday. Many thanks and by the way---is it possible to order the book as a gift for others or is the supply limited? -- Barbara Amiel, contributing editor, MacLean's Magazine, see Press section for Ms. Amiel's article on Caucasians.